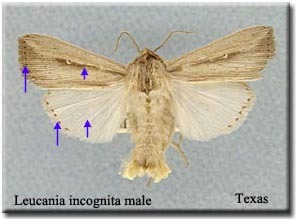 A closely related species, Leucania incognita, also has a dark brown streak running between the base of the wing and the discal dot. However, incognita is a much smaller species without the pinkish tones of this species. In addition the hindwing of incognita is pure white and has a series of small dark dots along the outer margin. These dots are absent in scirpicola. Diagnosis: Forewing flesh-colored and smooth appearing. 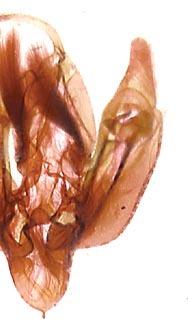 A diffuse dark brown streak runs longitudinally from the base of the wing to the discal dot. Discal dot a small white spot. Postmedial line represented by a series of small, black dots. 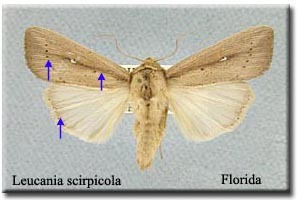 Hindwing hyaline white, but suffused with dull gray-brown along the outer margin. Distribution: Leucania scirpicola is a species of the southeastern and south-central United States. 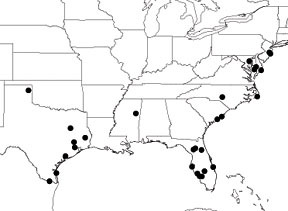 The species occurs along the Atlantic Coast in the east from New Jersey south to Florida. The species occurs westward to eastern and northern Texas.